D=160mm/H=183mm. Lever lid pails with handle 3.000 ml made of tinplate, inside and outside blank. Versatile usable metal packaging, perfectly suitable for paint and varnish. Lever lid pails with handle made of tinplate - the classic paint and varnish pails! 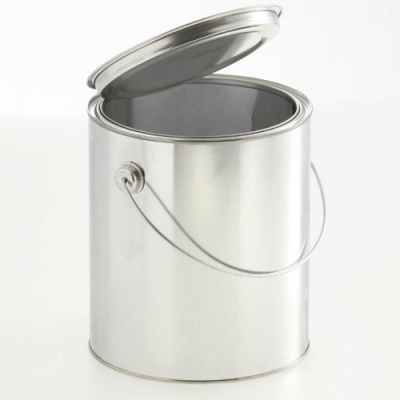 Our versatile, robust metal pails (lever lid cans) are best-suited as metal packaging for paints and varnishes on solvent-base (VOC), for modelling materials like paint, oil-based paint and lacquers, as well as glazes, oils, pastes and waxes. 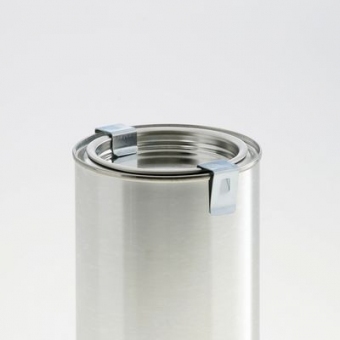 This metal can is equipped with a handle/shackle and is therefore called Lever lid pail. These lever lid pails are inside and outside blank. These metal pails are also suitable as packaging for dry groceries. All metal pails are delivered inclusive matching lid. The lids will be pushed in after filling, either by hand or machine. By rotating with a flat object (screwdriver), the metal cans pails be easily opened. Through the precise and tight seat of the lid excellent sealing properties are achieved. The special ring design ensures product residue will not cause the lid to get stuck. All Lever lid pails are made of tinplate (tinned sheet steel). Pails made of tinplate without an appropriate inside coating are not suitable for water-containing filling goods or moist storage/handling. Contact with water or moisture can lead to rust. - For pails/cans with anti-corrosion inside coating please visit our category “Lever lid cans inside coated” or ”Cans inside coated & stackable”.